The world's oldest real-life "Benjamin Button" is barely older than a teenager, but he has the body of a 160-year-old. Rupesh Kumar, 21, lives in India and weighs under 45 pounds, Express reports. He has a rare condition called Hutchinson-Gilford progeria that causes him to age quickly. It affects only one in 8 million people. The condition is said to have inspired "The Curious Case of Benjamin Button," the F. Scott Fitzgerald book and movie starring Brad Pitt in which a man is born elderly and ages backward until he dies as a baby. According to Express, Kumar was born without any complications and started showing signs of the condition at the age of two when his hair started falling out and his skin began to sag. Kumar's parents said that strangers flock to the village to see the man -- not to help him survive his condition, but to offer money to send him to the circus. 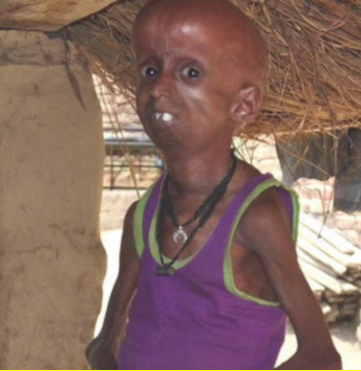 Kumar's doctor says there is no cure for the disease right now and most people with progeria die as teenagers.